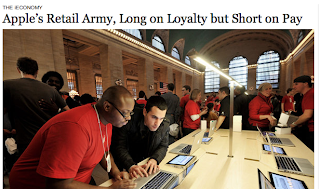 Last Sunday's New York Times front page lead was a feature story about the majority of Apple's U.S. employees, who are employed in low-level customer service jobs in Apple Stores. The story, which the Times researched for several months, resonated with me both for the similarities between Apple and Trader Joe's (which readers of Build a Brand Like Trader Joe's will be familiar with) and some of the differences in the way employees are treated. I particularly noted that Apple, like Trader Joe's, hires for personality and not product knowledge. As the Times put it, "the candidates of choice are affable and self-directed rather than tech-savvy. (The latter can be taught, is the theory, while the former is innate.)" Trader Joe's knows that the best advertising is word of mouth. We all know what word of mouth means, but it's easy to assume that this kind of organic advertising just happens. Click this image to go straight to Amazon and buy this book. 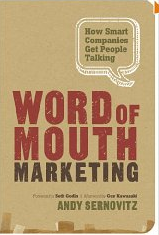 Andy Sernowvitz' book, Word of Mouth Marketing doesn't take that for granted. In this book, Andy provides a structure you can use to really understand the situations that enable - and prompts that trigger - enthusiastic customer referrals. Then, he lays out dozens of practical techniques you can use to build buzz about you and your company. As I read WoMM, I realized Andy could have used Trader Joe's to illustrate many (most) of the ways successful companies turn customers into fans (or even fanatics.) Like me, Andy wants your company to turn customer service into an ultimate sport. There were a number of times I thought, "Damn, I wish I'd thought of that when I was writing, Build a Brand Like Trader Joe's; I would have included it in my own book." No wonder his WoMM blog is found at: www.damniwish.com. This morning as I was walking back from the farmer's market, it occurred to me that in the current efficiency-obsessed downsized and outsourced economic environment, word of mouth is more important than ever. In old corporate America, a small number of large corporations each employed lots of people. Big companies had big budgets, large-scale communications opportunities and, often, messages suited to mass media. Big companies had a few marketing specialists, but most employees had other responsibilities. In new, outsourced America, millions of us are independent contractors. We don't have marketing departments; each of us is his or her own director of marketing. Nor do we have advertising budgets. That's why Andy Sernovitz' advice in World of Mouth Marketing is so relevant right now. This book is full of stuff you can do that won't cost you a cent, and will help you to build invaluable brand equity. Trader Joe's incredibly strong brand makes it a target for activists who believe that its customers are likely to share their political and environmental views. The question is, what are CEO Dan Bane's views? Meat Without Drugs, a coalition supported by the Consumers Union, The Center for Science in the Public Interest and the Environmental Working Group is calling on Trader Joe's to become a leader in the fight against the insane overuse of antibiotics in the livestock industry. 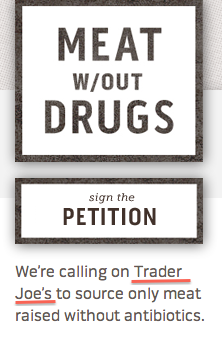 The coalition is asking Trader Joe's to sell meat raised with the minimal use of drugs. The standard they're calling for is not some idealistic, ultra-organic farming practice that's totally impractical. It's merely to limit the use of antibiotics to demonstrably sick animals, instead of preventively treating entire herds. The current practices have profound and short-sighted implications on human health. Readers of Build a Brand Like Trader Joe's know that Trader Joe's is quick to point out that its products are nominally free of GMOs, preservatives, and artificial colorants. But, in spite of its open, friendly, 'organic/healthy' vibe, the chain has typically been a follower, not a leader, on issues like farm-workers' rights or sustainable fisheries. I was surprised when callers were more or less evenly split between rapturous fans of the brand and Kansas Citians who were left cold. The lesson in this is, if try to ensure that no one hates you, you'll also be ensuring that no one really loves you. One of the real examples of Trader Joe's genius is that the brand doesn't try to be all things to all people. As I was leaving the station, Steve Kraske, producer Stephen Steigman, Mary and I chatted for a couple of minutes and it occurred to me that the closest Trader Joe's gets to what we in the ad business call 'brand advertising' is the radio ads the company runs in some markets. Trader Joe's says that it carefully chooses radio stations that emphasize news, talk, classical and jazz music -- stations that appeal to customers with better-than-average educations. That made me wonder, why doesn't Trader Joe's sponsor NPR programs? NPR delivers that demographic/psychographic profile in spades. If you're an NPR listener, and have heard local programming sponsored by Trader Joe's, please let me know when and where. I've been thinking about 'dark matter' a lot lately. Dark matter, for those of you in the, uh, dark, is undetectable, invisible stuff that so far exists only in theory. If it's undetectable, you may think, there's no reason to even think about it. But there is if you're an astronomer, because when you look out at the universe, the known laws of physics (mainly gravity, in this case) can't explain the rate at which the universe appears to be expanding. 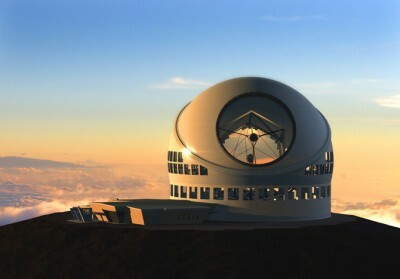 To explain the current rate of expansion, the universe basically has to weigh far, far more than the weight of all the stuff in it that we can detect. So, for the observed universe to make sense to physicists and astronomers, they now all agree that most of the universe's mass is made up of something they're calling dark matter. I'm not usually preoccupied with astrophysics, but lately I've taken a bit of heat for the subtitle of my book. A comment that I get a lot is, "But Trader Joe's does advertise! I get their flyers," or "I hear Trader Joe's radio ads," or "Isn't their web site a kind of ad?" Yes, you're right. So am I. To learn why, click 'Read more' below. Hey now. 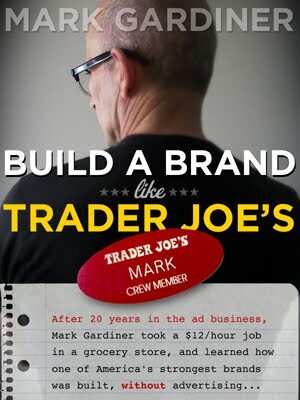 I was confident that over time, I could build an audience for Build a Brand Like Trader Joe's (yes, using some of the same techniques described in the book.) But nobody saw this happening. Phew. It's been a hell of first week already, and it's not even over. First The New York Times' food maven Julia Moskin pointed to "Build..." in the paper's What We're Reading blog before she'd even finished the book. Then, LinkedIn's Chip Cutter started a discussion about Build... by including it in the networking site's 'Social Media Marketing' update. 40+ commenters jumped in and I spent pretty much all day responding to them. It was a lively discussion. Steve Hall's Adrants (an AdAge 'Top 150' blog) also linked to TraderJoesSecrets. It's always a bit weird putting out an e-book, since the publisher (yes, that's me too) has such imperfect control over the buyer's reading experience. Since Kindle users set font size, for example, I have no way of knowing where line breaks will fall. Still, I've had no complaints from the many buyers of Riding Man; hopefully, that trend will continue with Build a Brand Like Trader Joe's. If you buy this book, and find a typo or experience other problems that make you think, "Is this what he wanted it to look like?" please contact me. Within a few days, there's going to be a page on this site that will make that easy. What is 'cultural branding,' and how did Trader Joe's do it? How Brands Become Icons is a deep, scholarly book, and I won't try to provide a functional summary. I do recommend that you download and read the relevant chapter here, if you want to learn more. My take on it is that Holt's first three categories are all variations on traditional 'strategic' branding. I think he'd agree with me that the first three are, usually, progressive stages in brand evolution. Don't get me wrong; brands don't inevitably evolve along this path, but a brand that fully succeeds at each level moves to the next one. My interpretation of Holt's theory is that if you do a great job building mindshare, you will in the process make an emotional connection with the consumer. Once you make that emotional connection, you enter their social conversation--that's 'viral' in this age of Facebook, Twitter, etc. but the difference is in the way we communicate, not what we communicate. That glowing screen is just the new water cooler. 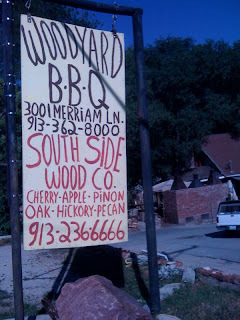 Cool enough for Anthony Bourdain, without the slightest hint that it's gone to the proprietor's head. It's funny that even in this age of e-pub, a book doesn't seem real until you can see a cover. The cover design for Build a Brand Like Trader Joe's was created by Mark Eimer. I love the way he's greyed-out my name, and blurred most of the photo, leaving only my ear and eyeglasses really sharp. It creates the impression that I was a low-key presence in the store, all eyes and ears. Eimer's treatment of the word 'like' also captures the message of the book. Small and greyed-out, but set off by the row of stars, it's at once subtle and highlighted. By using a script font, he reinforces the 'personal' nature of cultural brands. As Lee Clow says (see the post below this one) the goal is to a brand the customer likes to spend time with. 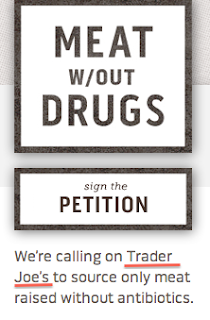 If anything, Trader Joe's goes further; its customers 'like' Trader Joe's in the same way they like their friends. Build a Brand Like Trader Joe's will be live on the Amazon Kindle site soon.